Professional learning is an entitlement and plays a central role in shaping teacher and lecturer professionalism, in building capacity, confidence and expertise, and in providing the sense of agency which allows teachers and lecturers to lead learning in their classrooms. It also provides essential space for the sharing of practice, collaboration and enquiry. The EIS has a developing role as a provider of high-quality professional learning opportunities. From its origins as a professional association it has been concerned with the interrelated concepts of teacher leadership, agency and wellbeing, and has long championed the need for a planned and coherent professional learning offer that supports career-long development. Increasingly our members recognise the potential of the EIS to be a key provider of professional learning and acknowledge the quality of programmes already on offer. The EIS, as a member-led organisation, is well-placed to hear and respond to the learning needs of its members. A resolution from the 2018 AGM instructed Council 'to develop a strategy to increase learning opportunities with a view to making the EIS a main provider'. We are committed to a teaching profession where opportunities for high quality, relevant professional learning, which meets identified learning needs, is available and accessible. These needs may arise from personal or professional interest, the needs of the school, the local authority or the college, but individual needs must be balanced with those of the establishment. Professional learning should be predominantly self-directed, with the teacher or lecturer as leader of their own learning. Professional learning should be an ongoing process and can take a variety of forms. Training courses, seminars or workshops. 'A Teaching Profession for the 21st Century' (2001) provided for 35 hours per year of continuing professional development (CPD) for teachers. To maintain registration with the General Teaching Council for Scotland, ongoing commitment to professional learning must be demonstrated every 5 years through the process of Professional Update. In relation to Further Education, the Review of Scottish Colleges report (2005) recommended that full time staff working in further education undertake a minimum of 6 hours of CPD per year. More recently, The Scottish Government published 'Education Governance: Next Steps' in June 2017. It set out the vision for a school and teacher-led system, recognising the need for a 'world-class support system', including professional learning and leadership development for the teaching profession and for the wider education workforce. Next Steps confirmed that Education Scotland would have a renewed focus on professional learning and leadership development, bringing clarity and coherence to the national landscape. This enhanced focus aims to ensure that teachers will be supported by a streamlined and coherent professional learning offer. Teachers value the contribution of formal leaders in school and believe their role needs to be more focused on enabling teacher-led professional learning and collaborative professionalism, along with local and national experts and academics. 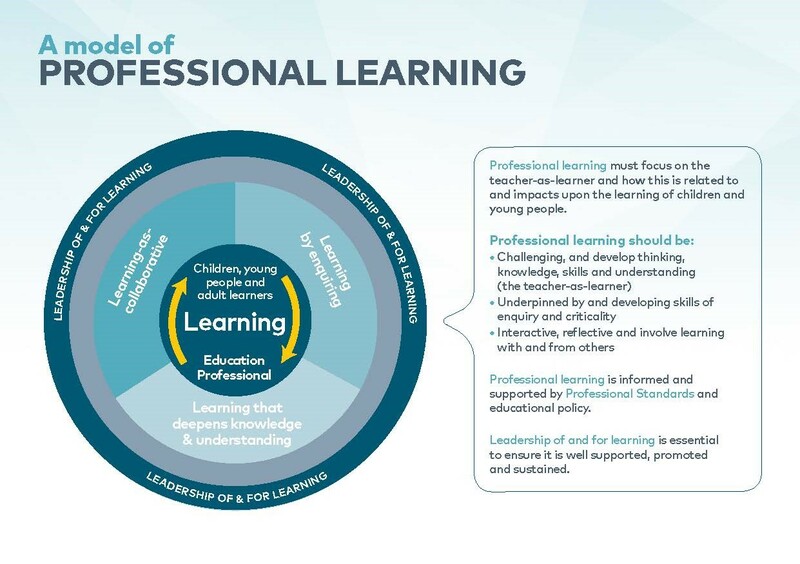 A revised model of professional learning identifies the key principles and features of effective learning that will build capacity and promote collaborative practices.